Fourier transformation is problematic for long range potentials (for example Coulomb interaction) since they usually do not become zero on the discretization interval. Different approaches have to be used in such cases. Please note, that this text concerns only the Hypernetted Chain closure relation at the moment. 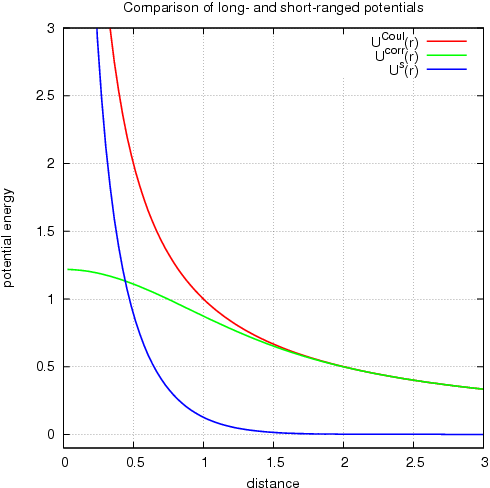 Percus-Yevick related discussion will be added later (PY shouldn’t be used with long ranged (Coulomb) potential, since it doesn’t perform well!). The second expression is used as a new (short-ranged) version of the HNC closure relation for the Ornstein-Zernike equation. with being adjustable parameter (pyOZ uses 1.08). This function agrees with the A/r potential overall with the exception of small distances. 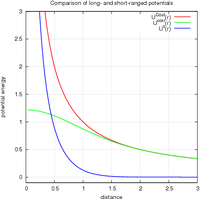 Therefore, subtracting this function from the interaction potential leads to a short ranged function (see figure for comparison, click for bigger version). For the purpose of pyOZ, we are interested in the Fourier-Bessel transform of this function, which is performed using the sine transform (see the links if you are not familiar with these transforms!). Last expression is the sought Fourier-Bessel transform of the function . Fourier transformation on short-range functions (the indirect correlation function uses modified closure defined previously) is performed discretely without problems. Recall, that Fourier transform of is known analytically. This equation is solved for and indirect short-ranged correlation function is calculated. After transforming back to real space, short-ranged Gamma is used in the closure relation, new short-ranged direct correlation function is calculated and used for next iteration (until convergence). In reality, pyOZ uses this algorithm for convenience even in case of short-range only potentials. In such a case, the correction (and its Fourier transform as well) are set to zero, restoring thereby the non-modified Ornstein-Zernike equation.